CUPE Prince Edward Island didn’t just mint new legislation protecting mental health for workers—they minted a commemorative coin to celebrate. 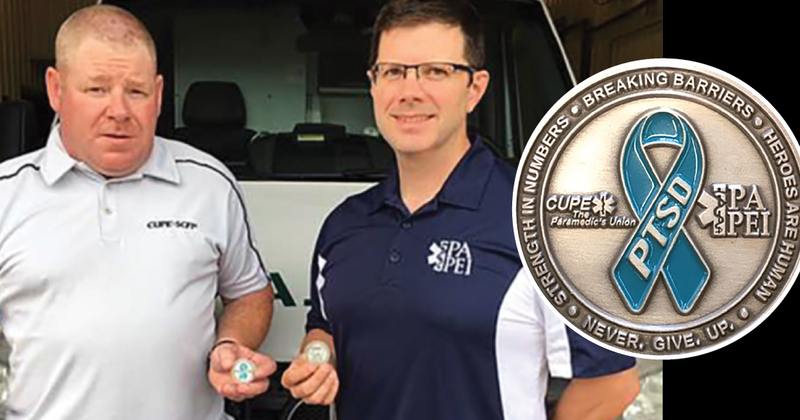 The commissioned coin, a joint effort by CUPE PEI and the Paramedics Association of PEI (PAPEI), was unveiled at a symposium on mental health for first responders in Charlottetown in early September. The coin celebrates legislation passed in May of this year that brought workplace stressors and Post-traumatic Stress Disorder (PTSD) under the province’s Workers Compensation Act. This means that workers can file claims under worker’s compensation and better protect their mental health and well-being. For the union, the coin was a way to mark the achievement— and to serve as a reminder that more work is needed. Jason Woodbury, President of CUPE 3324, and a 19-year paramedic, was instrumental in leading the charge within CUPE and in the community. “I believe this commemorative coin will remind our members and all workers on PEI that we need to continue lobbying efforts to seek improvements, like to recognize physicians’ capacity to make PTSD diagnoses and other mental health supports for workers across PEI,” he said. Woodbury was referring to changes the provincial government made to the private member’s bill that tightened access to diagnoses of stress and PTSD. CUPE and PAPEI both argued that family doctors should be able to make the diagnoses. The government amended the legislation to indicate that only psychiatrists and psychologists can do so. Woodbury and others fear this will lead to a bottleneck. Still, workers in PEI have greater protections for mental health and their victory will only inspire workers in other jurisdictions. The coin was formally unveiled with PEI MLA Jamie Fox, a former police officer, who worked with CUPE and PAPEI to bring forward the original private member’s bill.